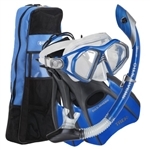 This advanced set includes the 2-Window Magellan Mask (with Purge Valve) and Atlantis LX Drytop snorkel. 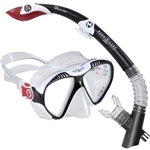 This set includes the 2-Window Anacapa 2 Mask and Island Dry Snorkel. Dive in with the Aqua Lung Jewel Snorkel Set. 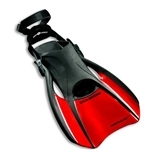 You’ll love the soft, adjustable fins with energy-saving efficiency, helping you glide across the water faster. The mask offers a silicone face and adjustable straps for a snug fit that keeps water out, and the snorkel delivers a one-way purge so you won’t worry about inhaling unwanted water. When you’re finished swimming, store your gear in the Aqua Lung Sport® TravelLite bag. All in one snorkeling package: includes Mask, Snorkel, Fins (Shorter Trek Fin) & Gear Bag. All in one snorkeling package: includes Mask, Snorkel, Fins (longer Proflex fin) & Carry Bag. Adult Set perfect for snorkeling and recreational swimming. The Adult Lux LX Mask + Phoenix LX Snorkel is a premium package for underwater exploration. High visibility safety snorkel vest provides extra positive buoyancy. 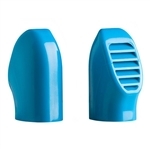 Adult snorkeling and diving mask featuring a hypoallergenic silicone face skirt for ultimate comfort. 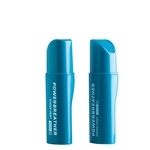 Spit antifog gel works on anything that fogs, including dive masks, paintball masks, sport goggles, ski goggles, eye wear, windows, binoculars, scopes & more. ! Not recommended for swim goggles. 1 oz. Jaws Scrub Mask & Slate Cleaner is an effective, mild abrasive solution that deep cleans without scratching glass or most plastic surfaces. 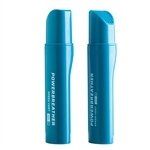 Removes product coatings, alkali residue buildup, pencil marks & grease pencil marks. Use scrub on dive mask lenses & skirts, plastic slates & more. CAUTION: DO NOT USE ON PLASTIC LENSES. The Trek fin is a compact multi-sport travel fin. Designed for body surfing, boogie board or snorkeling adventures. The Aqua Lung Sport Diva Silicone Mask and Paradise Dry Snorkel Combo has what you need for under water exploring. The mask has a hypoallergenic silicone face skirt for ultimate comfort and pinch-and-pull adjustable buckles for a custom fit. The snorkel has a dry top so when you go under water it closes off and in case water comes in there is a one way purge valve to keep the snorkel clear. 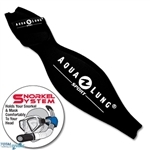 The neoprene snorkel system does not replace your existing mask strap, instead, it covers it. 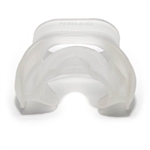 Your existing mask strap provides the tension needed to keep the mask on your face, while the snorkel system protects your hair from getting tangled in the silicone mask strap and/or snorkel.